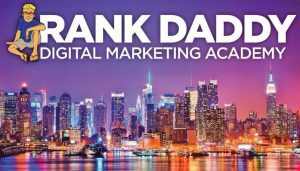 5 Figure Day Review: Is Viral Traffic Real? In your quest to gain financial freedom through online business, you’ve no doubt run across a program called 5 Figure Day. It’s a system boasting an innovative approach to online marketing, one that attracts traffic, obtains leads and generates commissions. This is my 5 Figure Day review where I’ll tell you just how viable this program really is. 5 Figure Day is an online program capable of boosting your subscriber list and increasing your following. As a result, your product will be noticed as you gain a growing potential customer base. The program claims to be fully customizable to the user’s specific needs. The program is said to have no hidden costs or fees, can be run from any location, fit to any schedule and anyone can use it. In essence, the program is a system where members are granted the ability to build numerous websites and generate money through automated leads and the generation of potential commissions. The product is advertised to offer unlimited income, draw large amounts of traffic, and build a private email list quickly by incorporating the work of others. A secret, never before used, method of building a subscriber list. Pro: The system offers a nice feature for users who decide to cancel their membership. If a member cancels, the system allows them to continually receive all commission and leads from their efforts up to the point of cancelation. Con: The free website is basically false advertising. It falls short of what most consider a website. In essence, it’s little more than a sales page. You will have no control or ownership over the website whatsoever. You’re a 5 Figure Day unleashed member referred by your friend, Mike. You advertise your affiliate link. Someone clicks on it, likes what they see, and enters their email to join your list. Next, this person is redirected to a new “squeeze page” asking them to re-enter their email. They enter it and continue. Unknown to this person, they have now joined Mike’s list. This system can be great if your subscribers know how to advertise their affiliate link. However, most don’t, which makes building the list a very slow process. Based on information collected in January 2014, the regular membership rate is $97 per month. You can use a 50 percent discount for the first month if you search for a promotion or affiliate-based referral. The system claims to offer a 60-day money back guarantee. You can try out the system for one month with an access fee of $47. This option promises to provide commissions and autopilot leads for a short amount of time and after/if the membership is discontinued. The official 5 Figure Day website also runs limited offers. New members have started using the system for as little as $1 for a single month. The membership is then continued at the regular membership rate. 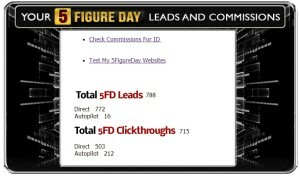 I joined 5 Figure Day in the first week of its launch, and I was able to build a subscriber list of approximately 700. I found the system to be a bit misleading. The training and resources available in the member’s area were mediocre at best. Although the program claims to be easy for newbies, my experience tells me a newbie would have difficulty using the system and likely not achieve much. If you have list building experience and understand how to market, you could make good use of this system. However, those with experience likely already have their own website—one where they have ownership and control. The program would feel like more of a hindrance than true opportunity. For most people, I would not recommend this program. If you would like to start a real business online, check out my top recommended program. Please leave your questions or comments about my 5 Figure Day review below or you can get in touch with me at Wealthy Affiliate profile. This is a comprehensive and honest review from someone with first hand experience of using it. A list of 700 in the first week is impressive though. It seems expensive and is gets newbies in without any real help,so thanks for alerting those that are looking for a better way such as Wealthy Affiliate. I joined 5 Figure Day within a week of their launch. It took me about 2 months to build that list or 700. It’s very expensive with very little value. I highly recommend people check out the free starter membership at Wealthy Affiliate. This is an excellent review. Very nicely structured and informative 🙂 You have a very nice clean and simple theme as well. I hadn’t heard of this program before and am also a member of Wealthy Affiliate. Having done the “list” thing too, as much as it works, I prefer to know that many other options available to me. Thanks! I have continued with the list building in cheaper and better ways than this program. All the money I’m earning right now is with list building but I’m also working with Wealthy Affiliate to create other options for income streams. Very interesting review of a typical autopilot program. Now I am convinced that automatic traffic may not translate immediately into positive conversion. The risk of such program is the revenue generated will not be sufficient to cover the cost of running it. Thank you! These programs sell themselves as being autopilot but the reality is that it takes a lot of work to get them up and running. For it to actually become an autopilot program, you need to find a lot of referrals that will work hard in finding new referrals. Unfortunately, this typically does not happen.